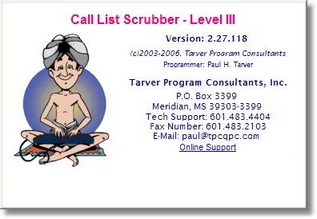 Use this handy Online Help feature to get the most out of Call List Scrubber! You can access this Online Help anytime by clicking on the "Online Help" button on our website or by clicking the big, blue logo on the main screen of Call List Scrubber. Don't forget that if you don't find the answer to your question here, you can contact Technical Support via telephone, fax, or email using the information shown above.